Comparatively speaking, I’m sure our winter is nothing to complain about, but that doesn’t stop me from having a daily whinge. My optimum operating temperature is between 19 and 29c so obviously things like an “Antarctic vortex” and low single digit mornings fit nowhere in this range. And that’s what we’ve suffered in the past few weeks. Now there’s just the smallest hint that Spring is not far away. All over the valley the wattles (acacia) are blooming. 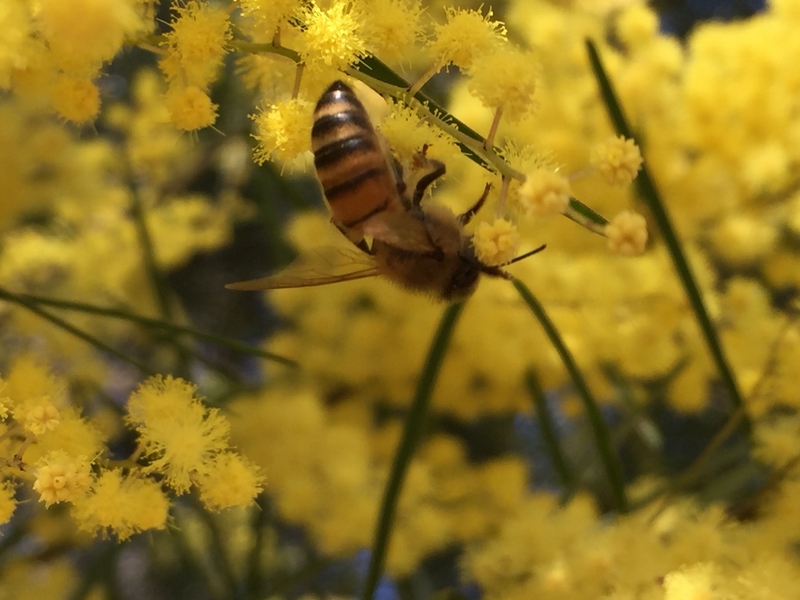 Our first National Wattle Day was held on the 1st of September 1910 as a way of promoting patriotism in our emerging nation. Un-patriotically, this year I’ll be in tea country high in the mountains of Sri Lanka, so I’m having my own little celebration now as my one and only wattle is putting on a spectacular show. There are over 900 species native to Australia and I’m having a little trouble identifying mine. I didn’t plant it and I suspect that it arrived via bird poo – and for once I am grateful – as it’s not a weed and smells and looks delightful. It’s also providing bees with some winter sustenance, and on that subject … my native bees have so far survived the frosty weather emerging last Sunday to clean out their hive. I can’t tell you how relieved I was to see them busily at work throwing out poo and dead bodies! Jack thinks your wattle looks like a cootamundra wattle. Not from around here. Oh Poo ! That makes it a weed ? 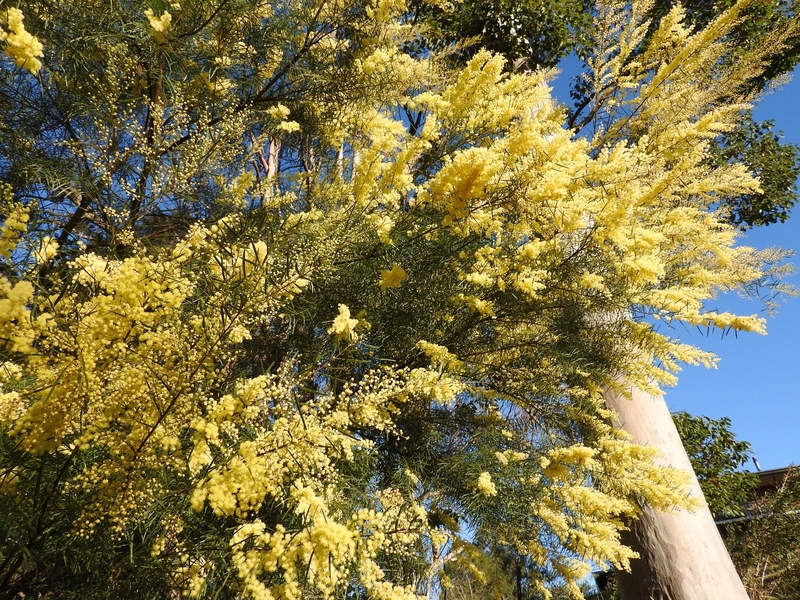 That is very different from the Cootamundra wattle we have around here – ours has grey leaves and they are a totally different shape, nothing like the long thin foliage you have there. Yours looks beautiful and not at all like a weed! Yes – I refuse to think of it as a weed!